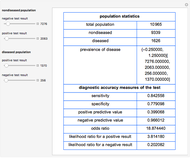 This Demonstration calculates various accuracy measures of a diagnostic test for a disease. This is done for differing negative and positive test results of nondiseased and diseased populations. The measures calculated are the positive predictive value ("PPV"), the negative predictive value ("NPV"), the (diagnostic) odds ratio ("OR"), the likelihood ratio for a positive test result ("LR+"), and the likelihood ratio for a negative test result ("LR-"). 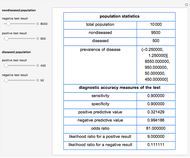 The negative and positive test results of the nondiseased and diseased populations are selected using the sliders. The Demonstration is appropriate as an educational tool for medical students. 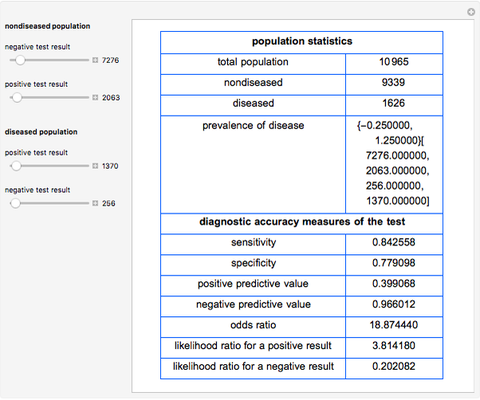 Theodora Chatzimichail "Calculator for Diagnostic Accuracy Measures"